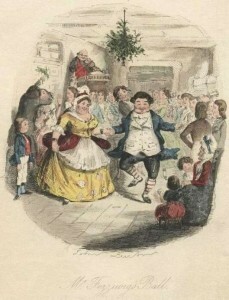 In Charles Dickens’ A Christmas Carol, a ghost grants Ebenezer Scrooge the chance to look back into his past and see a company holiday party that Fezziwig, his employer at the time, threw one year. Scrooge observes Fezziwig and his family, the employees and their families, the apprentices (including himself), the household employees and even some of the neighbors as they prepare, arrive and celebrate. One lesson is that a company holiday party needn’t be a hugely expensive* and arduous affair. It can be, but it doesn’t have to be. A simple, festive event to which people want to be invited is enough. Yes, you’re in business to make money or widgets or whatever. Whips and other similar inducements have been banned for quite some time and yet there are plenty of other ways to encourage people to produce. Fezziwig was profitable and his employees (and apprentices) happy. They still worked, but it wasn’t a toil or burdensome. They still made money, but they did so with happiness. When asked to quantify or catalog Fezziwig’s technique, Scrooge only says that “his power lies in words and looks”. These are “so slight and insignificant that it is impossible to add and count them”. And yet they are effective. Managers, what can you do—what are you doing—to make your employees’ “service light” and “a pleasure”? Please share with us some simple, effective ideas that you’ve found to bring your employees some happiness, this season and the whole year around. This entry was posted in Management and tagged Charles Dickens, management, workplace environment. Bookmark the permalink. I like this one best of all. Thank you. I had been working through this particular post for a few years now and the time seemed right to publish it. I’m glad you liked it. It’s one of my favorites, too.